← Welcome to Fit Mama 4 Life! I really love to cook and have been branching out and attempting more complex meals lately. Pinterest has been my best friend in the kitchen :). However, as most moms know, we are very busy during the week and preparing a meal isn’t exactly easy with a toddler running around, so I leave the gourmet meals for the weekends when I have some time and an extra set of eyes to watch Philip. 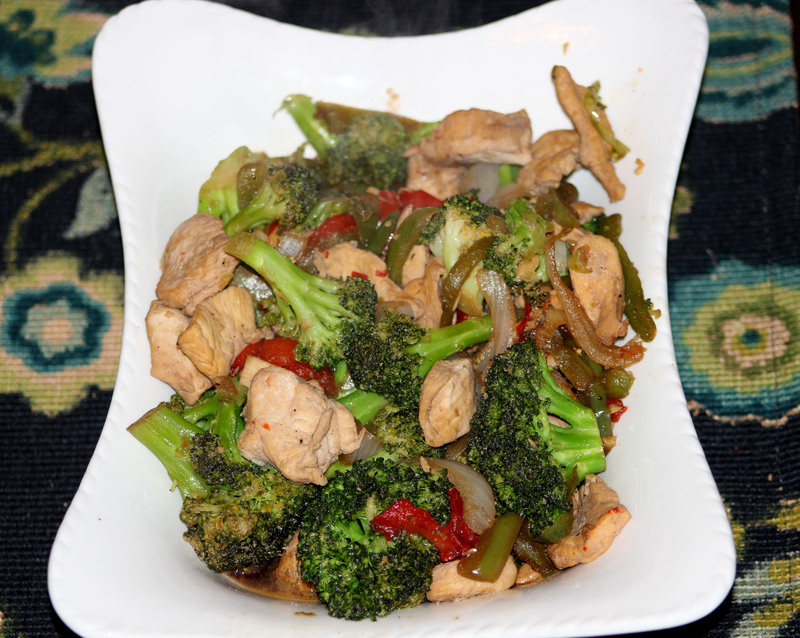 Chicken stir-fry is one of my weeknight go-to meals because it’s healthy, quick and tasty. Combine the chicken, olive oil and garlic in a bowl. Add the soy sauce as you wish…more or less for desired flavor, but make sure chicken is well covered in sauce. Marinate for 15 minutes. While this is marinating, prepare the brown rice according to package. Drizzle additional olive oil in a large cast iron pan over medium high heat and when hot add the onion, peppers and broccoli. Sauté the veggies for 5-6 minutes or until almost done. Remove the veggies and place in a bowl and cover to keep warm. Add chicken mixture to pan and stir occasionally for about 3-4 minutes or until the chicken loses its raw color. Lower the heat to medium low and add the veggies back to the pan and flavor with fresh ground black pepper and drizzle with a bit more soy sauce. Continue stirring until the chicken is fully cooked and vegetables soften a bit (about 5 minutes). Serve chicken stir-fry immediately over brown rice and voila, you have a healthy meal that covers all the bases! When it comes to meat I always try to buy organic because I want to avoid feeding my family meats that are pumped with hormones. We have Stop & Shop here so I use their organic brand, Nature’s Promise. I try to buy it on sale and freeze it even though I’ve found that its not much more expensive than regular chicken. In this dish you can add different veggies that I don’t have listed. Sometimes I add carrots or snap peas but it depends what I have in the house. With veggies I always opt for fresh vegetables, and if a recipe calls for it, fresh herbs, because I feel it makes a world of difference in the dish…so much tastier. Another time saver for prepping meals is to prepare them earlier in the day when you have a free minute. I try to prep when Philip is napping, this way I can throw everything together quickly for dinnertime. When I was working I would try to prep the night before or morning of.